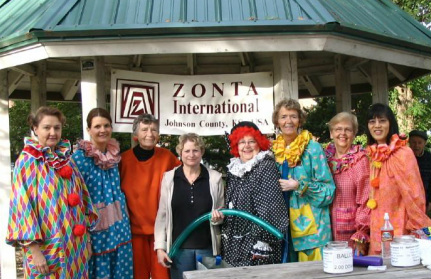 The Zonta Club of Johnson County supports various projects with financial contributions, scholarships and donations of goods and services. Fundraising activities include providing, in exchange for financial donations, face painting and balloon creations at local events such as the Overland Park Fall Festival. The Club has adopted Keeler Women's Center in Kansas City, Kansas, as its charitable partner. The mission of Keeler Women's Center is to empower women in Kansas City's urban core. Club members provide tutoring in English as a second language and assist Keeler Women's Center's clients with resume preparation and job interviewing skills. In addition, the Club contributes toiletries for women in shelters and household goods and furniture to women establishing new households. We also provide donations of holiday gift cards for clients in need.